There is a mirrored wall in our entry-way. Me no likey. However, Handsome Hubby won’t let me take them down or cover them. It can be a challenge to decorate because everything is reflected and can look too busy. 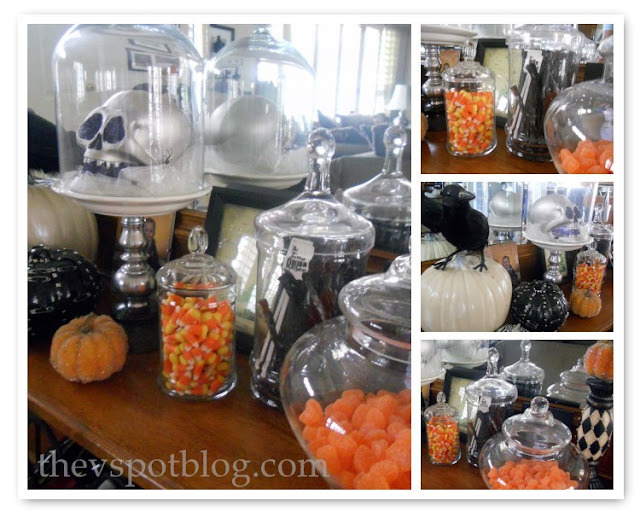 So in getting ready for Halloween, I chose to use light colors and a lot of glass. That way I can add a lot of “stuff” without it being too heavily reflected in the mirror. 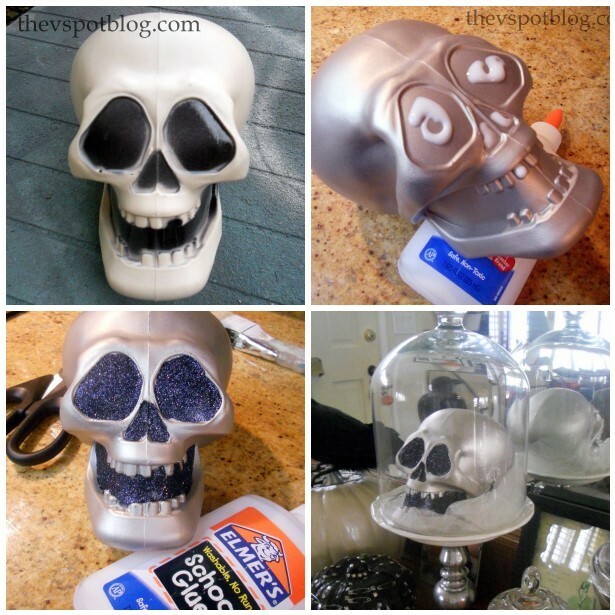 A Dollar Store skull was spray painted in a metallic champagne color. I brushed regular glue into the eyes, nose and around the teeth, then sprinkled it with black glitter. Once dry, I put the skull on one of my temporary pedestal plates with some tulle and a few plastic spiders and covered it with a cloche. oh, very nice. Where would we be without the Dollar Tree? I really like the way you’ve made the traditional Halloween orange show in the candy and pumpkin and kept everything else monochrome. So very cute. Love the Dollar Store and Dollar Tree. Should buy stock in them now that you’ve shown how to use so many great items from there and given them so much publicity. Thanks for the inspiration. P.S. Love, love, love black glitter. Luvs that skull!! Black glitter eyes??? You rock my world! You totally transformed that skull! Oooh, I’ve been trying to think of something to do with my Dollar Tree skull! You are SO FUNNY. You always keep me coming back (and wishing I could be more like you!). You deftly avoided showing any photos of the actual mirrored wall! I love mirrors, but mirrored walls? No, thanks. Your skull is genius. Or maybe it’s your brain that’s genius, and that skull in your foyer is evidence of that! So cheap! And guess what? I understood how you did everything! YAY ME! I think you did a great job decorating around you mirrored wall…it looks perfect…Love the glass with the pop of orange! Can I have that black licorice when you’re done with it? No, that would be gross, but it is one of my favorite things! That is way too clever. I need to go dollar store shopping with you and see that store through your eyes. Looks so fun! This skull is awesome! I def need to pay visit to my local dollar tree and really start on this party!!! I have less then 2 weeks at this point smh! Awesome blog! Works for me too!! He likes those mirrored walls?? Hmmmm…why?? That looks terrific! I really need to think outside the box and paint the cheesy plastic stuff – it looks so great when you do it! Glam Skull Under Glass!! I love it!! I so admire how you see past what something is to what it can be!!! What a wonderful makeover! So cute! great display…the skull is fabulous! Very spooky! I love how you dressed up the plain skulls by adding the black glitter…very creative! I always LOVE following your posts and you keep me inspired. Thanks!